Hello and happy Saturday! I sure am enjoying the weekend. How about you? The hubby and I decided to go to the flea market and thrift stores this morning and I found some great stuff! I have been much more selective when thrifting lately. I am really trying not to drag home things I don't need or have a plan for. Here's my haul for today. This basket thingie reminded me of a beehive and since my classroom is being decorated in a bee theme this year, I got this to spray paint and turn into a hive. It was just $1! This sweet little mirror will be joining a few others in a mirror gallery wall I am planning to have in my living room after the reno. It will be getting a paint job of course. I love the shape and design..it was $2. This brand new pack of ramekins was $1.99 at the Goodwill. Of course I had to have them since I have been collecting white dishes for a while now. I use ramekins quite frequently. These two milk glass bowls with handles were $0.79 each so they too had to come home with me. I use these plate stands quite often. This one is wood and a size I didn't have....it was $0.99. I have been needing a new spaghetti server for a while since I accidentally melted mine! This one is nice and sturdy and metal so I can't melt it...LOL! It was just $1. At the flea market, I bought this coffee table for $6. It will get a makeover, but for the price, I had to get it. We are moving our huge entertainment center to our bedroom and need a table for our TV to sit on until this winter. We are wanting to purchase an electric fireplace to put in the living room and if we do, the TV will hang above it. We just need something temporary for now, so I didn't want to invest much in a TV stand until we decide for sure. My favorite find of the day is this awesome wall cabinet! It is pretty big....around two feet wide and a little over 2 feet tall. Isn't is adorable? We are planning to use it in our bathroom when we remodel it. It will probably hold things we use daily, like deodorant, hair products, toothpaste, etc. I haven't decided yet, but I love it! It is seriously like new...I'm not sure that anyone ever actually used it. It was $17, but worth much more. I'll probably store nail polish in the bottom part. It's the perfect size for them. I got this stack of books for $2! I can't believe how cheap books are in thrift stores. This one is vintage...isn't it sweet? I bought it for the graphics. They are so cute! They would be sweet framed. I love black and white illustrations. We went into Lowe's to price some things for our reno and I was looking at lights for the dining room when I spotted one like this hanging from the ceiling with a clearance tag on it. It was marked $42. It was originally $159, so that was a steal!! I fell in love with it and snagged the last one off the shelf! I am not sure if I will leave it this color or paint it black. I will decide before we install it in a few weeks. So, those are my finds! It felt good to go treasure hunting since I haven't done much of it lately. I am very anxious to get started on the reno! We actually talked earlier and decided we may not go on a cruise after all. The one we wanted to book is sold out now which is OK, since we kind of want to stay home to get more work done and use the money to buy new furniture anyway. We're thinking maybe just go to the beach for a long weekend after the renovations are done....we'll see. I'm happy with that plan since we did just go last summer and we were already talking about going next summer and taking both our kids with us....:) So, hopefully soon I will have some renovations to share! Have a wonderful weekend friends! Hello friends! I am happy to report that my summer break has officially begun. It's been a whirlwind month of finishing up my school year and two and a half weeks of trainings and conferences, but it's all over now and I can relax and enjoy summer! I haven't had time to do anything creative yet, but I wanted to share my trip to Tampa for a conference I attended with three of my kindergarten teammates. We saw Dr. Jean, who is famous for her classroom music for young children. She has wonderful ideas for teaching! We had a great time! 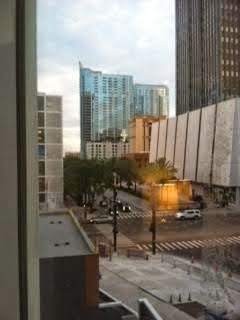 We stayed in the business district, downtown Tampa. Here is the view from the window in my room. 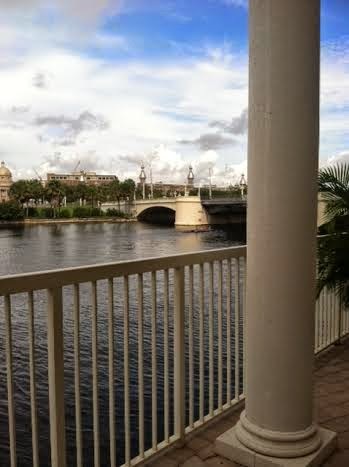 Here is the view from the conference room in the hotel. So pretty! 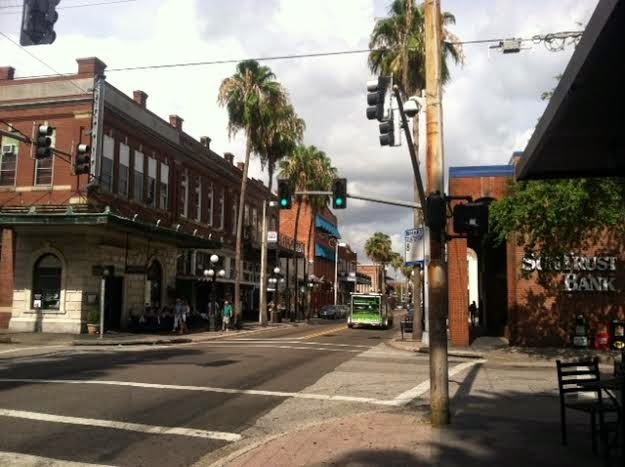 Ybor City is a historic neighborhood in Tampa, Florida located just northeast of downtown. It was founded in the 1880s by cigar manufacturers and was populated by thousands of immigrants, mainly from Spain, Cuba, and Italy. Here's a picture I took of one of the streets, It is a unique area filled with a variety of shops and restaurants, tattoo parlors and bars. I was not really impressed with the place, but it did have some charming qualities. It is home to The Columbia, which is Florida's oldest continuously operated restaurant and the oldest Spanish restaurant in the US, as well as one of the largest Spanish restaurants in the world with 1,700 seats in 15 dining rooms and taking up an entire city block. This place is steeped in history and it was a treat to visit. They have a flamenco dance show nightly, but we were too early for that. We did see them rehearsing though! 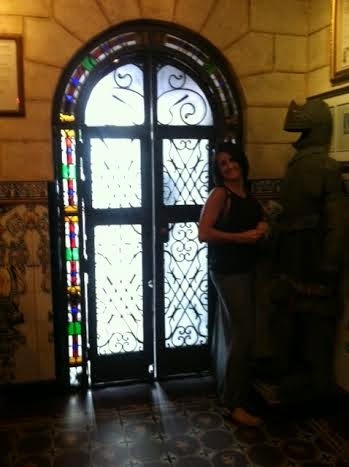 Here's my friend and co-worker, Amy standing near the beautiful stained glass doors. 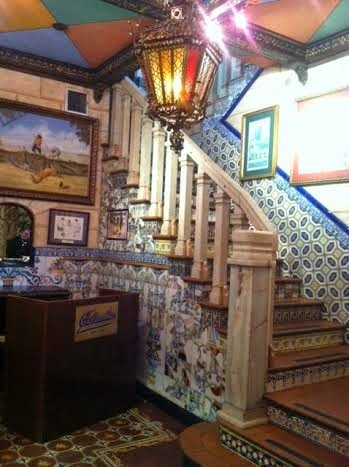 There are many entrances and exits in this restaurant. I would love to take a tour of the entire place. 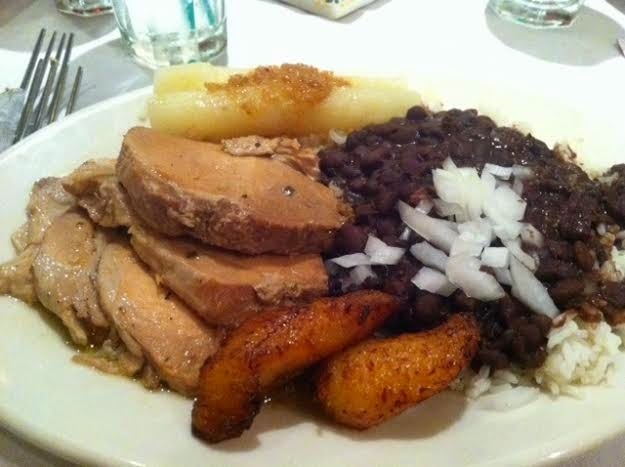 I had the roast pork with black beans, rice, plantain, and yucca. I do not care for yucca...no flavor and I dislike the texture. Everything else was very tasty though! This was the view from my seat. 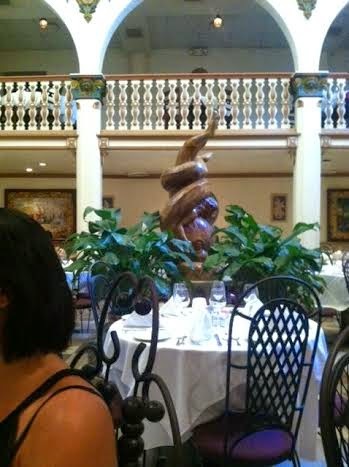 The statue is inside a fountain in the center of the room. The details in the architecture and the decor is stunning! This is one view of the outside. The doors are the ones I showed you from the inside above. 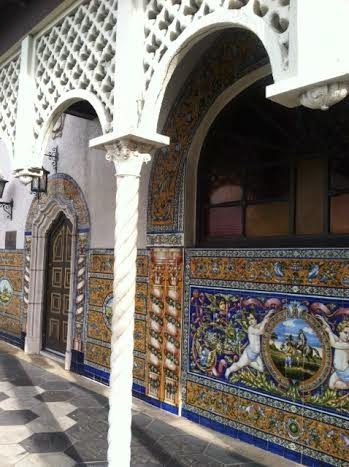 There are gorgeous hand-painted tile scenes surrounding the building. After day two of the conference, we went by Ikea. I introduced two of my teammates to it back in December when we traveled to Orlando for a conference. Amy had never been though and she loved it too. We ate there before heading home. 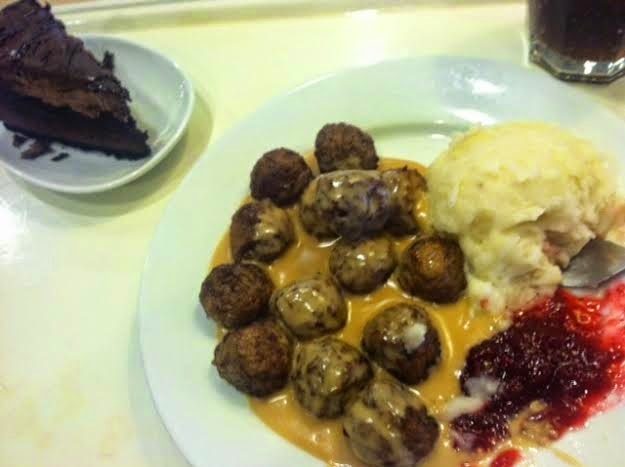 I had the Swedish meatballs with mashed potatoes and lingon berry sauce. It was very tasty, as was the slice of chocolate cake! Of course I bought several things for both school and home. I will share the things I bought for my home. 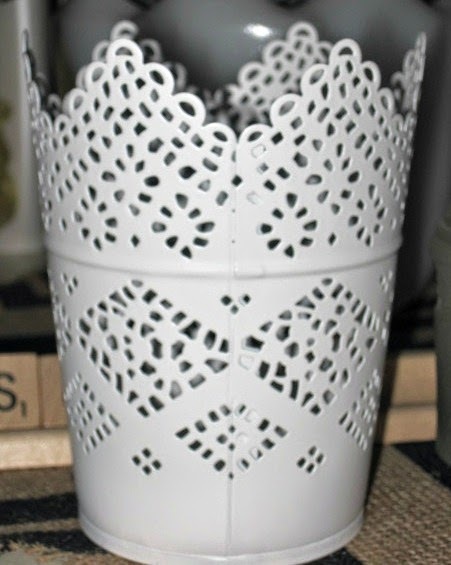 First up is this lacy planter. Not sure if I will put a plant in it or use it for pens and pencils. I bought some wooden spoons and forks. I have been needing some and I love the chunky size of these. They were so inexpensive at just $1.49 each! I finally bought my aqua blue Raskog cart I have been eyeing for quite some time! Can't wait to fill it up! I love this set of nesting baskets. 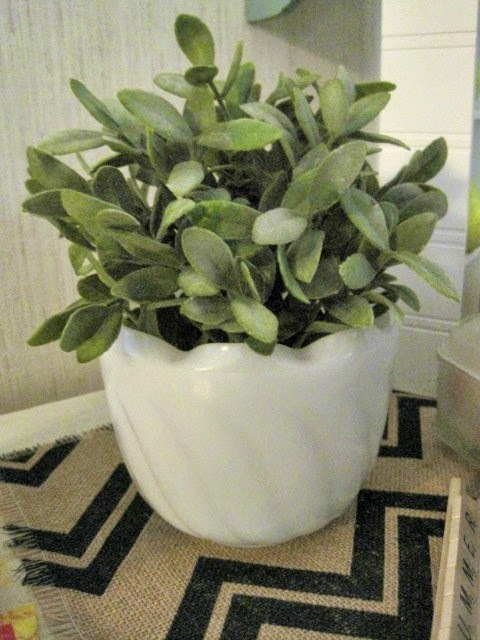 I bought two fake plants...here's one. The milk glass is my own. And here's the other. I like that they look realistic. And that's my trip in a nutshell! I had a great time with some amazing ladies, but I am happy to be back home with my hubby, son, and Sadie. She was happy to see me....:) Yesterday I went for my MRI and Mama rode with me. We had a nice lunch at BJ's and ran into Publix after my appointment so I could pick up a few groceries. After all the eating out I have been doing lately, I am happy to be cooking at home and trying some new things. I am trying to lighten up our supper for the summer. Last night I made a yummy wrap. I wish I had taken pictures, but forgot. I used a tortilla, homemade guacamole, sliced turkey, applewood smoked bacon, muenster cheese, lettuce, tomato, and chipotle mayo. It was so yummy! Joey really liked it too. Tonight is another new sandwich recipe and I'll try to remember to take a picture to share. Have a beautiful day my friends.....until next time. Hello friends! Has it really been a week since I posted? I love it and so does the hubby! 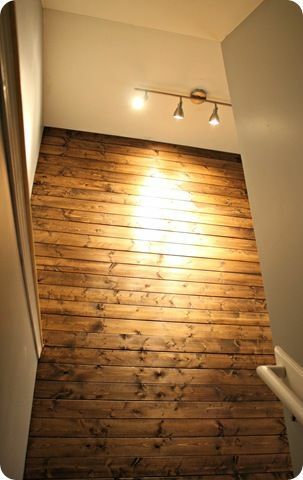 Ours will be the same dark walnut color as this one as well. I can't wait to get started. I have been picking our paint colors and looking for a new sofa and chair. Overstock has some really pretty furniture and great prices plus free shipping, so I will probably order from them. I plan to paint one of my end tables and will be looking for another one to redo at a yard sale or thrift and if I can make room for one, I would love to have a coffee table. We haven't had room for one for years with our chunky furniture. We already have the flooring and will be going to Lowes later in the week to pick up everything else. I can't wait!!! After the living room is complete, we are moving on to the dining room and library. I have plans for those rooms too, but I will share them later on. So, as you can probably tell, my mind is spinning with ideas. Along with being excited about our upcoming remodels, I am also really excited about our upcoming vacation. We had planned to spend a few days at the beach, but it's really hard to find a nice affordable place that isn't booked already, so we have decided to go on another cruise. Believe it or not, it's going to cost less to take a 5 day cruise than it would to rent a nice place for 5 days. And the beauty of a cruise is that food and entertainment are included. We are going on a Western Caribbean cruise to Cozumel, Mexico and Grand Cayman, Cayman Islands. I can't wait! I'm most excited about the excursion we are planning to take which includes riding in a submarine and looking at a coral reef and then visiting the world's only green sea turtle farm! I love sea turtles and can't wait to interact with them! We'll be setting sail July 7th if nothing stops us! First up are two games I bought for my kinders. They can both be used in my small group time to enhance their learning. The will be required to answer questions or read words for me in order to move on the board. They love to play games and don't realize they are learning while they are playing. These were both like new with no missing pieces and just $0.99 each. Great deal since the Monkey's game is $25-$30 new! The monkey one is based on the book Five Little Monkeys Juming On the Bed and will be great for the beginning of the year when they are just learning to count. I found a pair of Dockers shorts for the hubby still new with tags for $5. I bought a pretty top for myself for $1.50 as well as a pair of navy blue capris for $1.50. I didn't take a picture of those. Both pieces were like new. I couldn't resist this set of hand stitched napkins in my favorite shades of aqua blue. There are 8 of them...I'll probably keep four and sell four. Aren't they lovely? They kind of remind me of a snowflake. I bought these foam shapes to use in my classroom this fall. New in package for $0.49 each! Last thing I bought was this vase/urn. I picked it up to see how much it was and when I saw the maker's mark on the bottom, I looked it up using the Internet on my phone see how much it sells for. Mine has a few chips but for the price I couldn't pass it up. See the bird design? In good to mint condition, this piece is selling for over $50 on Etsy and $80 on Ebay. Mine is not is mint condition, but I will most likely be keeping it anyway, so it doesn't matter. This is why I bought it....it's the only piece of McCoy I have ever found and it was a steal at $1.49! I also went by Bath & Dody Works and they were having their huge semi-annual sale so I bought a few things in there. I love their hand soaps and the kitchen lemon is my favorite to keep by the kitchen sink. The Forever Sunshine body wash smells heavenly! I had to run into TJ Maxx to look for something for my out of town conference tomorrow and found this. It's the tall one on top. I've been collecting these dairy themed things for a while and you may remember me saying my kitchen and dining room have a subtle milk and honey theme going on. I had to have this piece! it was only $3.99...gotta love TJ Maxx! I want to share a good deal I found online before I go. Shutterfly has an awesome deal right now. You can get a 16" x 20" print for free. They are normally $17.99 with $4.9 shipping. You can get one for just the cost of shipping through 6/26/14 by typing the code DAVIDSPRINT in the code box at checkout. I ordered one this morning and I can't wait to get it. Here is the one I decided on. There were several I wanted, but I finally decided on this one. I took this picture on my mom and dad's property last year and added the text to it on PicMonkey. I am planning to make a frame for it using some weathered wood and hang it in my living room after we finish the remodel. And...this reminds me that I need to update you on the health issues some of you have been praying about. The hubby went to the orthopaedic center this week and he has a really bad case of tennis elbow as well as carpal tunnel. Since he uses his arm every at work, it is having a hard time healing. The Dr gave him a brace thing to wear on his forearm to hold pressure on the tendons, as well as some medication for inflammation. The brace is helping, so that's a blessing. He goes back in 5 weeks. I'm hoping the cruise will help it heal...:) I was thrilled that it was nothing too serious. I go for an MRI Wednesday on my lower back. I pray it doesn't reveal anything serious...hopefully it's just my arthritis spreading to this area. We'll see! 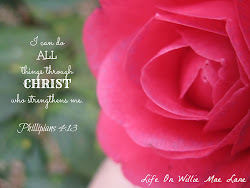 I thank you for your thought and prayers...blog friends are the best! 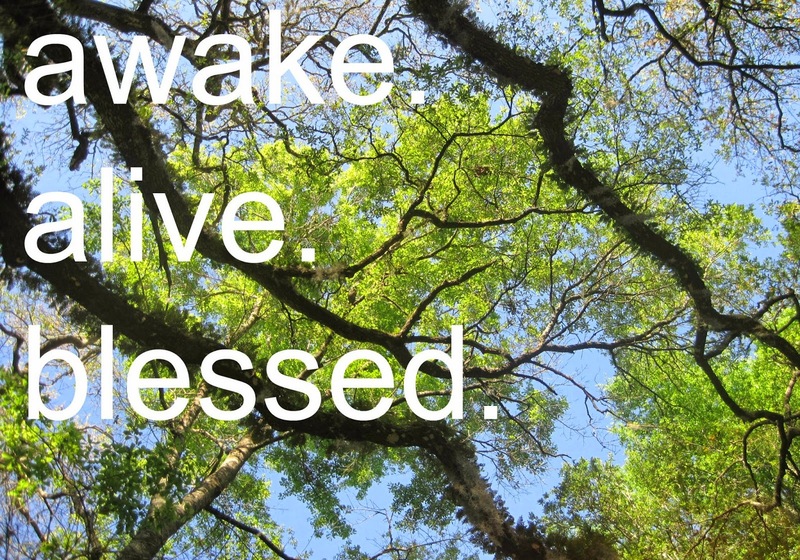 Have a beautiful weekend.